Let our team of experts provide you with an onsite thermographic inspection. This will help identify all the high risk areas that can cause water leaks, air/heat loss in your home. Log homes that are built in 2005 or later typically have a foam gasket, which has been applied in the tongue and groove system as a log home is constructed. Over time the logs will season, expand, contract, and cure. This leads to large gaps in the once tightly fitting tongue and groove system. This also causes the foam gasket to become ineffective. 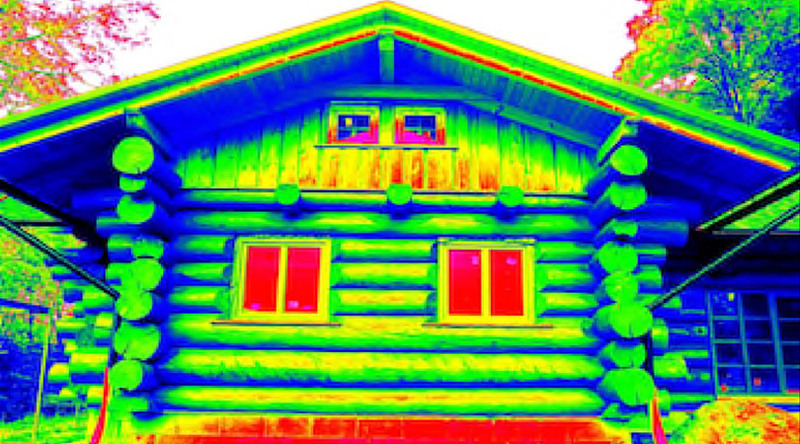 For our purposes, Thermography is a method of viewing building materials through the use of an infra-red camera to detect temperature differences. These images are then analyzed to make recommendation for repairs. This allows our customers to visually see where the leaks are located on the home. Target specific spots of water or air leaks thus saving money by being able to directly seal the specific spot of concern instead of a whole wall that is not needed. Find Water Leaks – Sometimes!! See the complete log home restoration process by watching this video.